In-season savings on casual, comfortable Hang Ten canvas shoes - order today and save. 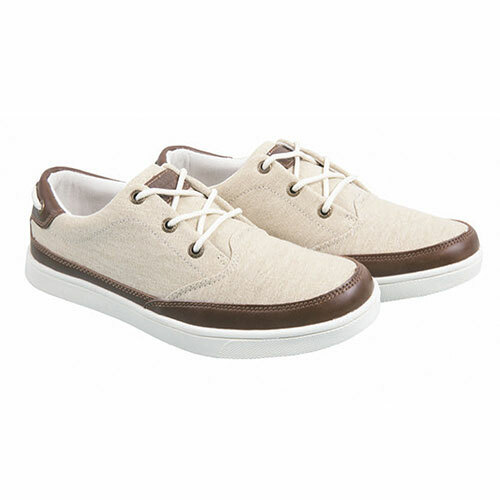 When the mercury starts to rise, you'll be glad you thought ahead and ordered these Hang Ten Venice shoes. Inspired by classic skate shoes, they feature a light canvas design that's not only super comfortable, it's durable too. And the ISEON accents and contrast trim make them the perfect casual match for jeans, chinos or shorts. Also features lace-up front for a custom fit and SurfLite ultralight outsole. Color: Tan. Mens size 12.